To keep apace with its market innovation commitment to developing solutions that deliver high cost-effective quality print solutions Mimaki is proud to announce the brand new direct to shape UJF-7151 plus – the industrial small format UV Inkjet flatbed printer. Ensuring high quality printing and top level productivity with ultra-accurate ink droplet placement, the UJF-7151 plus has a maximum printable size of 710 x 510 mm (28 x 20in). The best digital on-demand industrial small format printing solution for the screen printing industry improves accuracy, consistency and reliability by modifying the mechanical structure of the print table. Fine lines, edges, and small texts are displayed crystal clear. 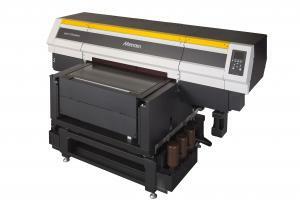 The solution also enables double-layer printing and colour printing on a white base layer. The daily operation is enhanced by the patented MFD1 dithering technology that processes image data along with retaining the original image quality and the highly improved quality control MAPS4 that reduces banding and uneven colour printing. Uninterrupted printing and reduced waste is aided by new printheads that incorporate a continuous ink circulation system to help prevent ink sedimentation and clogged nozzles and a nozzle check unit (NCU) that automatically detects and cleans the clogged nozzles. Uninterrupted printing as a result of high-stability printing through an ink-circulating mechanism within the head. NCU that automatically detects and recovers clogged nuzzles by cleaning them, thus reducing waste. The Mimaki UJF-7151 plus industrial small format flatbed inkjet printer will be available from November 2015. The solution will be on display at following upcoming shows: Viscom Italia, Viscom Düsseldorf and Inprint 2015. Journalists who would like to schedule a meeting, booth tour or demo on the UJF-7151 plus, can contact Maya Staels.